Raymond is a self-taught bass player born in Guadeloupe (French West Indies). He began playing guitar at the age of seven after his brother Philippe introduced him to the instrument. After his introduction to the guitar, he chose the bass and taught himself. Since this first exposure, he has discovered the beauty of music and art as an expression of a free human being. He began his career as a musician at the age of sixteen debuting on guitar. 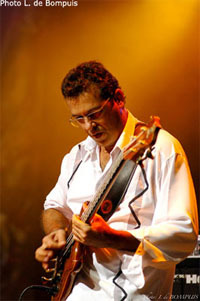 Raymond plays a variety of bass instruments, basses with 4, 5 or six strings, and sometimes double bass. From 1978 to 1986, Raymond performed in venues in Paris and accompanied several groups recording CD's. In 1982, "he participated in the creation of the Caribbean Jazz Ensemble," which toured numerous Paris's venues and released their first album "His head sank" (1983). Raymond was immersed in the Caribbean music scene in Paris from 1984 to 1986, and then he returned to Guadeloupe, his primary musical base. After his return, he accompanied and toured with a number of musicians. 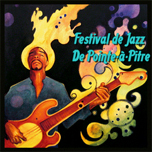 In 1986, Raymond returned permanently to Guadeloupe at the Festag at Pointe-à-Pitre. It is often asked for recordings of zouk or gwo-ka. At that time, it also has the opportunity to play with Andre Condouant. 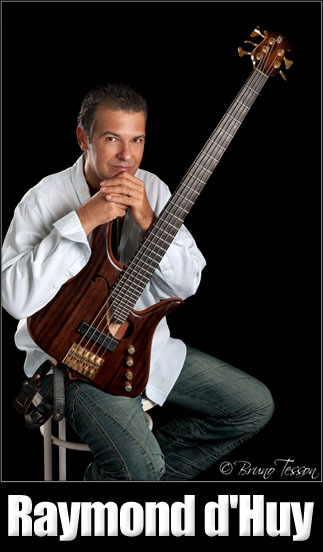 In 1987, he accompanied Didier Lockwood during a tour in Guadeloupe and Martinique. In 1989, he played in Mozayik, then; with the Caribbean Jazz Ensemble, he participated in the recording of "Blue Morning." The following year, his participation in various festivals are multiplying: Jazz Festival Paris and Freiburg Jazzhauss in West Germany in 1990, Jazz Festival Pointe-à-Pitre in December 1990. In 1992 appeared a new work by Caribbean Jazz Ensemble, "Inheritance," in which its influence is decisive. 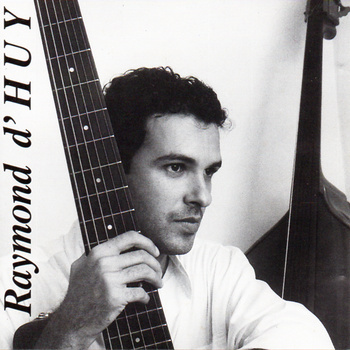 In 1994, Raymond recorded his first solo album "Jacques Joab." In 1997, he and his brother Philip, released "Brothers of Huy" and "Zapping." From the release of these CD's, Raymond worked on a number of local music projects. In 2004, he joined with Norman Deveault on piano, and Fred "Junior" Despan on percussion to become "3D," a trio, which played a blend of Caribbean and Latin Jazz. 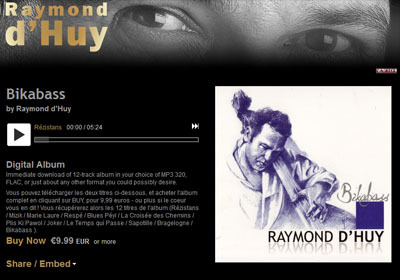 In 2007 Rayond released an album entitled "MesTissages" (Interbreeding), which is a mix of "different rhythms such as Biguine, Mazurka, Gwo Ka sounds, Latin-Jazz and much more". Recorded with long-time friends, "MesTissages" is a subtle "musical rainbow, a texture of different influences blend together in one great mix". 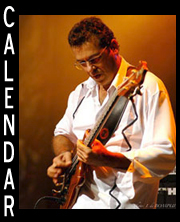 In 2009, Raymond, with his brother Philippe d'Huy, pianists Jean-Michel and Michel Lesdel Mado and drummer Raymond Grego opened for SMV (Stanley Clarke, Marcus Miller and Victor Wooten) at Abymes. Raymond, Jean-Michel and Raymond Lesdel Grego then formed the trio, "Alchimik's", and released a self-titled album. The group was well received in the Caribbean and also on Martinique. In 2012, Raymond released, "Bikabass". The bass centric CD, which features a compilation of music performed during Raymond's career, from the Caribbean Jazz Ensemble, through his performances with groups and trios. Raymond can be heard performing at venues on Guadalope. "Musicien et auteur-compositeur, né à Pointe-à-Pitre en 1962, Raymond d’Huy est d’abord initié à la guitare par son frère Philippe dès l’age de sept ans et n’opte définitivement pour la basse – qu’il apprend en autodidacte – qu’à l’âge de seize ans, époque à laquelle il devient déjà professionnel. Marqué par ses débuts à la guitare, Raymond d’Huy varie les plaisirs en jouant de différentes guitares basses de 4, 5 ou 6 cordes, et parfois de la contrebasse." 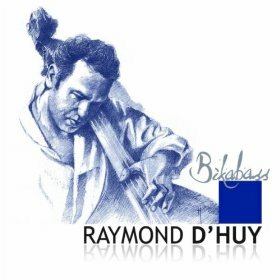 We have long said that on one hand Raymond d'Huy is an undeniable virtuoso bass, and secondly it has a real sense of the beautiful melody. He proves it again with "Bikabass" and from the opening track, "Rezistans" sets the tone for an album on which he worked for almost four years, immediately after the release of his last album, "MesTissages". Jazz side may be mentioned his obvious masters: Pat Metheny ("Marie-Laure," for example) and Marcus Miller (on 'Joker', taken from the successful album "zapping" the Brothers of Huy - 1997, already). 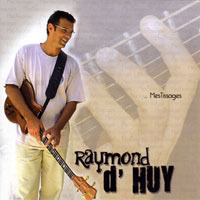 But around the frame of its purely Caribbean jazz ("Mizik"), Raymond d'Huy adds his many influences, they are melting, zouk, reggae, free (some flashes, listen to "Crossroads"), gwoka or rock, in particular worked hard - and not just music, the cover also - and abundant, where the bass is alternately breath, rhythm and melody. There are many around the leader signatures known and appreciated, the accomplices of Alchimiks - Jean-Michel and Raymond Lesdel Grego - the longtime - Dominique Berosus, ... Jocelyn Menard brings his Christian Laviso guitareka to "Peyi Blues" and Raymond highlights the voice of the talented Leedyah Barlagne two songs sung on the album, "Respe" and "Ki Pawôl Folds." But we find also jumble Sadikalay Philippe, Didier Just Sonny Troupé, Andy Narell, Ruddy Levis ... "Bikabass" certainly marks a culmination in the bassist's career, which we present here one of his finest achievements, and this must be known."